To anyone perpetuating the misconceptions that CFOs are accountants, bean counters or number crunchers – among many other outdated stereotypes – it’s time to put them to rest. To the CFO community, these are all but laughable characterizations, reminiscent of a time when CFOs only played an advisory role to the CEO. Over the last 10 years, the quintessential CFO has been completely redefined. The modern CFO has become the CEO’s strategic partner, emerging as an action-oriented leader with the power and insights to make big decisions. Countless CFOs have embraced this grab the bull by the horns mentality, resulting in a dynamic role where the CFO is taking action and forging initiatives that have historically been left to other executives, such as the COO or CEO. Carol Tomé of Home Depot, for example, has championed a number of strategic initiatives since the early 2000s. She slowed new store openings from one every 48 hours to two per year in order to invest in technology, employees and operating efficiencies. Similarly, Mark Loughridge at IBM is credited with simplifying IBM’s message and developing a clear vision for the company to help investors and customers understand what IBM’s future would hold after selling its PC business. Last year, Starbucks CFO Troy Alstead took on additional responsibilities as group president of Global Business Services, expanding his role. In this new position, he assumed duties that include overseeing global financial, technology and supply chain operations. As these power moves continue, the dynamic between the CEO and CFO is changing significantly. According to the seventh annual American Express/CFO Research Global Business & Spending Monitor, 92% of CEOs rely on CFOs to be either an influential or determining factor in operational decisions for the company. Traditionally, CFOs would step in at a much later point in the decision-making process, acting as an ad hoc advisor. 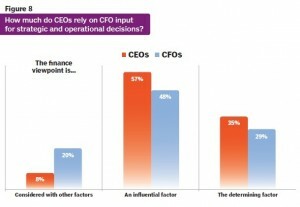 However, given the unique level of understanding CFOs have of the company, it makes sense that CEOs would tap CFOs as a key decision maker, or at least maintain a higher level of integration. Since 2008, this relationship has really kicked into high gear. Still shaking off some of the post-recession paranoia, companies are hyper-aware of the need to balance costs in what is still considered an uncertain economic environment. So, in an effort to make every dollar count, CFOs are heading up strategy themselves, and are now weighing in very early on in the decision-making process. In our research, we found that companies increasingly view CFOs as a catalyst that moves the business forward. When CEOs and CFOs come together, it promotes a “can do” culture within the company, as they are able to troubleshoot and align on the best course of action in real time. Looking to the future, CFOs will continue to work with CEOs more closely and stretch past their normal functional boundaries in order to add new value across the business. I would like to thank Shane for his contribution to this blog. You can view Shane’s LinkedIn Profile, or read Shane’s Bio here.